Electrostatic Fibers to conceal baldness and thinning hair. Nanofibers are a unique formulation of pure keratin that have been precision cut by laser to microscopic dimensions. After cutting, the fibers are dyed and are coated to enhance the retention of electrostatic charge. The dried fibers are then hygienically packed into containers, which are constructed from a sophisticated polymer that stimulates static charging of the fibers whenever the container is moved. 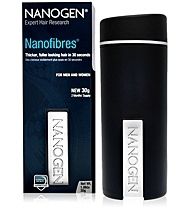 Nanogen is applied quickly and without mess by simply shaking the container over the thinning area, releasing thousands of the microscopic colour-matched hair fibres, which intertwine with, and branch off of the real hairs. Nanofibres are a unique formulation of pure keratin that have been precision cut by laser to microscopic dimensions. After cutting, the fibres are dyed and are coated to enhance the retention of electrostatic charge. Instantly eliminate the appearance of bald spots and thinning hair. Contrary to what you may think, thinning scalps contain thousands of colorless 'vellus' hairs (peach fuzz) which can been seen if you look very carefully at a balding scalp. These hairs, together with normal 'terminal' hairs are able to bond tightly with Nanogen fibers when they are sprinkled over the thinning area. An incredibly natural pattern resembling a Fir Tree branch is achieved on each individual hair. As each of the thousands of remaining hairs are thickened many times over, the appearance and feel of density is confidently achieved. Nanogen is designed to work equally as effectively on both sexes, and for people of any age. Whether you're a gentleman who accepts gradual loss over the years but would like to cosmetically control the rate and scale of their thinning appearance or if you are a lady that has a thinning problem which tends not to get much worse than patchy loss or generalized thinning - Nanogen is perfect for you. Take back control over your loss and don't look back! It is safe for both men and women, all day, every day. Finally there is a way to conceal thinning hair without the need for messy creams or old-fashioned sprays which simply colour the scalp. Nanogen is different. Using specialist microfibre technology, each hair is made thicker and fuller in an instant to produce outstanding results not seen with any other similar product. Take a few minutes to read through the information on this site and find out how YOU can have a fuller looking and denser feeling head of hair - INSTANTLY. Q. How long Do the fibers last? 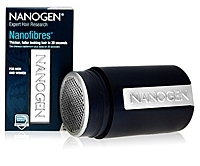 A. Nanogen fibers last approximately between 45 and 60 days dependent on use. Simply shake (with the lid screwed on) to gauge how much you have left. Do not leave yourself short. Q. Will the fibers become dislodged? A. Applied correctly, the fibers can be used with confidence. We recommend applying a layer of fibers, followed by a few short bursts of the spray to hold them in place. This should then be repeated for extra volume. Q. Are the fibers safe to use with hair regrowth formulas such as minoxidil? A. Yes. These special fibers are completely non-toxic and do not interfere with any topical formulations that you may be using. Nanofibres are simply cosmetic preparation. Q. Can the fibers stain clothes or bedlinen for example? A. No. Our fibers are 100% colourfast so no dye is transferred. If the fibers drop onto a surface, simply dust them away with a dry hand. Q. My hair is greying slightly - Are Nanofibres suitable? A. Yes. You should sprinkle the main colour first (e.g. black, brown, blonde etc) followed by a sprinkling from a grey (or white) container. The fibers are completely dry and will intermingle perfectly. This method can be used with any color combination (e.g. highlights). Charged with static electricity, they bond in fir tree patterns along the hair fibre so securely that they will stay in place all day, in strong winds and rain, and will not stain or smear, but can be easily washed out with a shampoo wash. The fir tree pattern creates a realistic looking AND feeling density. Other sprays and creams simply colour the scalp to make the hair loss less visible. Nanogen is completely different. As the Nanofibres actually cling to individual hairs, the effect feels natural and allows styling like you never again thought possible. Every time you look in the mirror you will be truly amazed. As explained earlier, Nanogen is a unique formulation of pure keratin that has been precision cut by laser to microscopic dimensions. After dissection, the fibres are dyed and are specially coated to help them to retain maximum electrostatic charge. The dried fibres are then hygienically packed into containers, fabricated from a type of plastic that efficiently donates static charge. Unlike imitations, only the patent pending Nanogen dispensing unit uses advanced polymers to add static charge during use. Look for the special "Nanogen" markings. 1) Wash and Dry hair. After styling, sprinkle Nanogen Nanofibres over the thinning areas until the scalp is no longer visible. 2) Using your hand, pat and shape the area so that the Nanofibres can merge seamlessly with your existing hair. Don't use a comb or brush. 3) Apply Nanogen Locking Mist to bind the hair-fibre matrix. Cosmetically, Nanogen is the most amazing thing I've ever seen. Friends that I've known for years can't believe their own eyes. The transformation in my appearance has had an astounding effect on my social life. I am so confident, relaxed an happy. I have a full head of hair. I feel like I have been given a new lease of life. I am a new man! I felt about as low as you could get. There I was, a middle aged woman with male pattern baldness. I was fast becoming a recluse with no-where to turn until I found out about Nanogen. You were really helpful and together we chose a colour that exactly blended in with my hair. I no longer see the baldness and nobody else can either. I have used Nanogen fibres for over a year. I have diffuse thinning which nobody apart from close friends and family know about as Nanogen gives the illusion if thick, healthy looking hair. I personally could not survive in my job without this product as I have to travel a lot and meet many people. Nanogen has given me the confidence to meet those challenges head on. Nanogen is magic! I suffer from diffuse thinning and the worry and horror of it has really ruined my life. I haven't felt like I could go out anywhere, and overnight visiting was out of the question. But now, thanks to Nanogen I am feeling that I might even be able to manage a weekend away. My grateful thanks. I am delighted with Nanogen as it gives me the sort of improvemnet which doesn't embarrass me (wigs can be embarrassing and the change they produce is too dramatic), but Nanogen Nanofibres produce a lightweight transformation and disguises the general thinning which I suffer from. I also have a bald patch of scarring alopecia, but with Nanogen this doesn't show up nearly as much through the rest of my hair. I'm delighted. This has changed my life. My hair no longer looks so sparse now, and I can sit under a light or in sunshine without worrying. It helps not only maintain a Nanogen application to last longer, but it also creates a fuller, natural look! Aqua, Sodium Laureth Sulfate, Sodium Lauryl Sulfate, Prunus Africana Extract, Urtica Dioica, Beta Sitosterol, Borage Seed Oil, Green Tea Extract, Propylparaben, Superoxide Dismutase, Cocamidoprpyl Betaine, Citric Acid, Methylparaben, Spearmint Oil, Zinc Sulfate, Copper Glycinate, Niacinamide, Pyridoxal 5-Phosphate, Saw Palmetto Extract, Disodium Cocoamphodiacetate, Cetrimonium Chloride, Propylene Glycol, Diazoldinyl Urea. Aqua, Sodium Laureth Sulfate, Coco-betaine, Cl 17200, Methylchloroisothiazolinine, Magnesium chloride, Methylisothiazolinone, Cocamide DEA, Sodium chloride, Parfum (fragrance), Phenoxyethanol, Panthenol, Glycol distearate, glycerin, Cocamide MEA, Dimethicone, Methylparaben, Laureth-10, Propylene Glycol, Citric acid, butylparaben, ethylparaben, Isobutylparaben, Propylparaben, Formic acid, Cl 16035, Fucus Vesiculosus extract, Magnesiu nitrate.